This May Day we call for antagonists of the global work machine to gather in Phoenix to march on the headquarters of the Arizona Department of Transportation (ADOT). 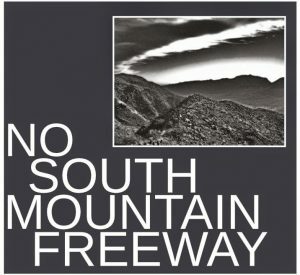 ADOT is the transportation bureaucracy behind the 30 year push for an extension to the Loop 202, which would destroy the western ridges of South Mountain and extend the south end of the Loop 202 from the I-10. This freeway would not just expand the patchwork of suburbs and strip malls into the desert, it would expand the design of bureaucrats and capitalists to build CANAMEX international trade corridor from Mexico to Canada. The struggle against the NAFTA and TPP trade agreements has been fought here at home in the form of resistance to transportation infrastructure. The South Mountain Loop 202 extension and its role as a truck bypass, as well as ADOT’s projects the Interstate 11/CANAMEX trade corridor, are key pieces of this transportation infrastructure. International trade agreements, their roads, and development are said to boost the economy, which doesn’t benefit us, and at what cost, anyway? This project has been opposed by members of the Gila River Indian Community since the 1980s. There are numerous harmful impacts of freeway construction which include destroying the prehistoric villages of Villa Buena and Pueblo del Alamo, the destruction of threatened/endangered animal habitats, and the destruction of plants that are central to traditional O’otham culture. Environmental impact studies of the 202 freeway also state that the habitat for wild horses in Gila River would be irreversibly lost if the freeway is built, and that no alternative habitats for the wild horses exist. Residents to the north of GRIC oppose the freeway as well, as Ahwatukee residents have protested and organized to halt the possibility of a freeway as well. The most prominent project organized against the freeway is Protecting Arizona Resources and Children (PARC). PARC is planning a lawsuit aimed at stopping the freeway extension by taking ADOT and the Federal Highway Administration to court over health and environmental concerns. Speaking for ourselves, we have chosen May Day to march on ADOT and to denounce the Loop 202 extension, as we oppose the trade routes of global capitalism which move goods and people, hastening the misery of daily life in this work obsessed society. We also march on ADOT because the freeway will destroy the habitats, dirty the air, and lower the quality of life for humans and animal alike. In Europe, as in Africa, people honored the woods in many ways…They did this in May, a month named after Maia, the mother of all the gods according to the ancient Greeks, giving birth even to Zeus. In Greece, Rome, Scotland, Scandinavia, and elsewhere, the people celebrated with music, communal activities, dancing, fires, planting of trees, and erecting of maypoles. In the spirit of pre-capitalist May Day celebrations of Spring, and the current manifestation of resistance to capitalism, we call on all those who oppose another freeway bringing destruction to the earth, air, and water. As we oppose work, we call on all those opposed to the global work machine, and the freeway’s role in accelerating the delivery of goods and movement of workers along its path. We believe that anti-authoritarians and anarchists engaged in projects around the ecological, anti-infrastructure, or anti-militarization struggles must also articulate their relationship to the indigenous people of this occupied land. To echo the call put forth in Accomplices Not Allies, a struggle against colonialism must attack the colonial structures and ideas. Whether you can join us in Phoenix, or are in other areas of Arizona, we encourage anti-colonial organizing this May Day. Join us on Friday, May 1st at 10 AM to march on ADOT. We will be gathering at Cesar Chavez park, located between Washington St. and Jefferson St., west of 1st Ave in downtown Phoenix.